Way back in 2012 a Parabatix video popped up online which started my obsession with paramotoring. Just three months later my paramotor training was booked with Skyschool UK and I couldn't wait! 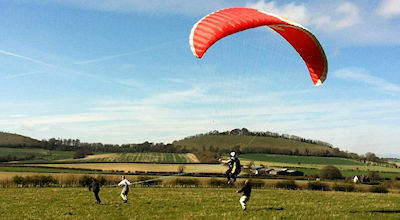 Skyschool is one of the biggest paramotor training schools that runs UK courses throughout the spring and summer. I found them and many other schools after a google search, but decided to go with skyschool after reading lots of positive reviews. I was also able to watch some of the previous Skyschool students on their Facebook page and YouTube channel. Seeing the instructors in action showed me how professional they were and was definitely another selling point. So the first day of my paramotor training finally arrived and I travelled down to Mere in Wiltshire to meet with Alex Ledger. 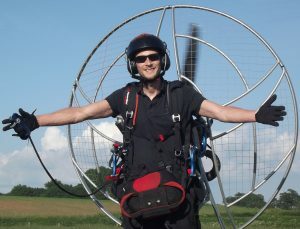 Alex is a paramotor/Acrobatic Paragliding pilot and is the main man behind Skyschool. We met in the centre of town along with four other aspiring paramotor pilots and second instructor called Zeb. 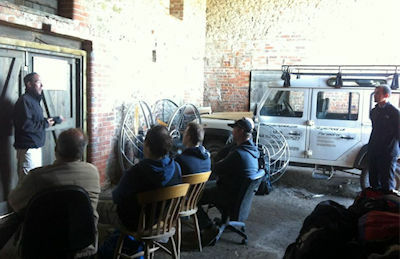 After a quick chat we headed to the main training site to start the theory of flight lecture. The lecture covered the basics of how an aircraft flies and the forces/reactions you could expect from the paramotor wing as you fly it. We were also given an introduction to APPI PPG, the sport, and the school. The weather was perfect so this was only a quick lecture before heading out to the field to start ground handling. Zeb gave us a demonstration of a reverse launch and explained the technique we'd be using to kite the wing. He explained the risers and lines and showed us how to clip into a ground handling harness. The wind was quite strong so we were given training wings which are much smaller than regular paramotoring wings. These wings are much easier for beginners to handle and are less likely to drag you along if you trip over. I found it quite hard to keep the wing flying above my head but Zeb gave me some great tips. My main problems were being too heavy handed on the controls and not moving with the wing. It took all of us most of the morning to get to grips with reverse launches but we weren't done yet. 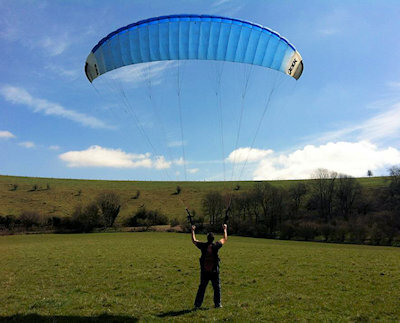 After a quick lunch break we went on to ground handling full sized paragliding wings. These were obviously much bigger than the 12 square meter training wings, and they required a slightly different technique. We also learnt a few different techniques including kiting without a harness. When Alex and Zeb were happy with our reverse launches we moved on to forward launching. I found forward launches much easier to get the hang of, but we still spent a couple of hours doing launch after launch. This develops muscle memory and launching soon starts to feel much more natural, you get to a point where launching becomes second nature. Day one of paramotor training was over and we were all super tired and very sunburnt. After the best nights sleep I've had in years I woke up with blisters on my face from the sunburn. So if you're thinking of taking a paramotoring course remember your sun cream! Day two of paramotor training started off with another hour of ground handling before moving on to hand towing. Hand towing lets you feel the sensation of leaving the ground while being pulled into the air. It also gives you the opportunity to flare the wing for the first time and to practice your timing. Alex connected two ropes to my harness and laid out the wing ready for a forward launch. Two of the other students were on the ropes and Alex was ready to run behind me. I pulled the wing into the air and started to run, the two students were also running and keeping tension on the ropes. I felt myself leave the ground and at this point Alex gave me a big push to help keep me off the ground. I climbed to about 10 feet before coming back down to try my first flare. The first flare was good and leaving the ground was an awesome feeling! I was towed two more times until Alex was completely happy with my flares. I helped tow some of the other students into the air before moving on to untangling, folding, and caring for the wing. This part of paramotor training is super important! Since training I've seen many pilots get their lines in such a mess that they've spent days untangling them. Many pilots make the problem worse trying to untangle, but Alex showed us a way to quickly remove any tangle. We were taught various ways to fold a wing and how to prevent the lines getting tangled during packing. We were also shown how to check the wing and lines for damage, and also some checks that should be carried out before every flight. We were then taken up to the top of the hills that surround the main site to do our first top to bottom flights. These first flights are taken in very calm conditions without the motor to give you a feel for the wing. They increase your confidence and give you a chance to launch, fly, and steer the wing before adding the motor. The wind was still a little to high when we reached the top so Alex offered everybody a tandem flight while we waited for the wind to drop. Unfortunately the wind had dropped too much by the time my turn arrived, so my tandem was very short lived. Alex packed the tandem wing away and we got straight to the top to bottom flights. I was given a helmet with radio communications so Alex could guide me through the flight. There was still enough wind for a reverse launch so I launched the wing, turned around, and ran into the air. The feeling of floating along effortlessly was amazing! It was a little scary the first time but Alex talked me through the whole glide down to the bottom. I flared and landed perfectly, then I climbed back up the hill and got ready for top to bottom number two. I managed four top to bottoms before sunset and they all went perfectly. Unfortunately the second day was over but the weather forecast was perfect for day three and I couldn't wait. 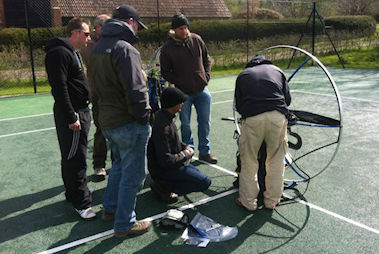 Paramotor training day three kicked off with a look at the paramotors we'd be flying. We learned safe starting procedures and how to safely clip in to the paramotor harness. We also wore the paramotor to get a feel for running along under power emulating a takeoff run. The feeling of being pushed along by the motor takes a little getting used to. You also have to be careful not to hit the throttle so hard that your legs can't keep up. After this we went through paramotor maintenance and the safety checks that should be done before every flight. We were asked a few questions by Zeb to make sure we'd absorbed the information before going any further. Anything that we were unsure of was repeated until it was 100% clear to everybody. We then got the paramotors ready for our first flights that would take place in the evening. We clipped in to the harness and attached the paramotors carabiners to two ropes to check the hang angle. This is called a hang test and is essential before a first flight. We also practised getting into the harness just like we'd be doing after takeoff. You need to slide out of the harness to land so we also practised getting back out. This was also an opportunity to move around in the harness to see how the weight shift worked. Weight shift allows you to steer the paramotor simply by leaning in the harness. While we were sat in the harness hanging from the ropes we were also talked through reserve deployments. We were shown exactly how to throw one and what to do with the wing after the reserve has opened. The reserve parachute is a lifeline in the unlikely event that the main wing fails, all of the skyschool paramotors are fitted with one. The paramotors were all set up and ready for our first flight but it was still quite early in the day. Paramotoring in the midday sun would be dangerous so we headed to a local pub for some food and a little theory. Alex covered basic meteorology where he spoke about safe and unsafe weather conditions. He covered clouds, what they mean, and which ones you should never fly by. He also spoke about turbulence and the potentially lethal hidden dangers you should never fly into. We then watched some of the Skyschool good, bad, and ugly videos which are also available on YouTube. Alex talked us through each students good and bad techniques to help us avoid doing the same. Things like jumping into the air too early on takeoff and flaring too early on landing were addressed. These videos definitely helped me a lot. After lunch we headed to the Parajet factory for an air law lecture and a quick look around the workshop. Parajet were very welcoming and seeing the paramotors going through the different stages of production was really cool. I also got to take a look at the skycar in the flesh, can you believe that thing actually flies? 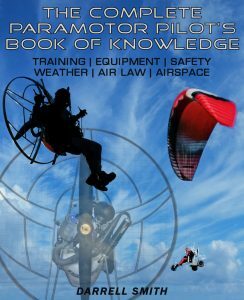 The air law lecture covered the basic rules we have to follow when flying paramotors. We were also taught about NOTAMS, and we were shown an airspace map and taught how to read it. When the lecture was finished we headed back to the field for some more ground handling while waiting for the wind to calm down. The wind finally calmed down enough for my first solo flight and I felt pretty anxious. The last three days of paramotor training had me well prepared, and I felt more than ready. But not knowing what to expect with the added weight and power made me nervous. I took a few deep breaths as I strapped in and walked over to the wing for a reverse launch. Alex checked the harness and helped me clip the wing onto the paramotor. He asked me to do a six point check to check that the harness, carabiners, and my helmet were secured. Everything looked good, the wind was perfect, my radio was working, so I went for it. I was launching from the top of the hill again so running down the slope made things a little easier. Alex also likes to launch people from the hill as it's much safer. You're straight up high and away from many dangers as soon as you leave the ground. I started to climb and at this point I was still hanging from the harness and not in my seat. We'd been shown how to get into the harness earlier that day so this should be easy. When Alex gave the all clear I parked my brake and used my hand to pull my seat into position. A quick wiggle of my legs and I was in, I continued to climb and was talked through every step of the flight. The flight lasted about 20 minutes and by the time I was ready to land I was feeling a lot calmer. Alex guided me into the landing zone, I flared and landed perfectly. Alex shook my hand and it felt great to know this was the start of something awesome. Skyschool day 4: More flying! Day four of paramotor training kicked off with another trip to the top of the hill. 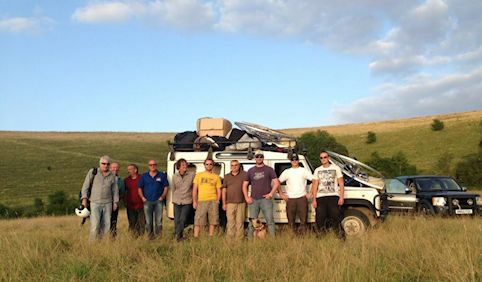 We loaded the Skyschool land rover up with lots of wings, harnesses, and a paramotor. The day was spent doing lots of ground handling, top to bottom flights, and a second paramotor flight which was awesome! This time around I felt much more relaxed after realising that all of my fears were totally irrational. This flight was also a little different as I was able to fly my own wing which was a reflex wing. Reflex wings require a slightly different technique during launching and landing so this was another good learning experience. After 5 days of strong wind and rain we were finally able to meet for day number five of our paramotor training. The wind was blowing from the north so Alex chose a different location 15 miles from Mere near Alvediston. The site was beautiful and it made the perfect paragliding/paramotoring location as you can see from the picture above. I met Alex and the rest of the guys there around midday and was able to clip straight into a harness ready for a top to bottom. The wind was a little stronger than when I did my previous top to bottoms, so this gave me the opportunity to try ridge soaring. I launched the wing and immediately felt the lift from the wind blowing up the hill. Alex talked me through the flight as I flew back and forth across the top of the hill. While making tight turns I realised what little brake pressure you need to turn a paraglider compared to a paramotor. A beginner paramotor wing takes quite a bit of brake input to get it turning. I eventually lost lift and glided down to the bottom of the hill for a landing. When I reached the bottom I really wished I'd been able to make a top landing to avoid the climb back up. The hill was huge and it took a good 20 minutes to climb back to the top. I did this three more times before the wind dropped enough to get a paramotor flight in. This time I was able to fly the paramotor for 35 minutes along with two other visiting pilots. Flying along with other paramotors felt great, but my wing was much slower so I was soon left behind. The flight went great and Alex told me that on day six I would be flying my own paramotor. The final day of paramotor training was another new learning experience. I had bought a paramotor a few weeks before the start of my training, so Alex let me fly it to get my first flight in under his instruction. 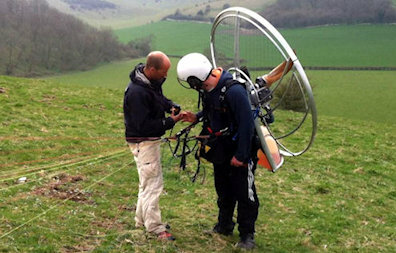 Buying the paramotor before training was actually a big mistake, as you'll find out later. So anybody that is thinking of starting paramotoring should wait until training is over. I launched from the top of the paragliding hill and immediately noticed that my paramotor had a lot less power than the Skyschool machines. I was at full power and it took a few seconds to start gaining altitude. I had bought a paramotor that simply wasn't powerful enough for my weight. The rest of the flight wen't well and my beginner paramotor training was over. I travelled home and waited for some nice weather to take my first flight without an instructor present. The area that I live in is surrounded by valleys and trees which can make flying very turbulent. This meant that I had to wait for calmer winds to launch my paramotor. I tried on multiple occasions and failed miserably every time. I soon realised that during training all of my ground handling had been practised in a good amount of wind. Trying to launch in 2 mph wind was proving to be a lot more difficult. I decided to pack the paramotor away and continue to practice forward launching in low or zero wind. I spent the next two months perfecting my launches but decided to return to Skyschool for an intermediate course. This would also allow a few more flights to build up my confidence. The intermediate paramotor training course was another six days, but it involved a lot more flying. I managed a whole four hours flying over the six days, but it wasn't without its problems. My under powered paramotor was about to prove to me how much of a mistake I'd made buying it. I took my first flight of the course from the bottom field, this was my first time launching from a flat field. The flight was quite late in the morning and was the first time I'd experienced strong thermals. It got so bumpy that Alex decided it was too thermic to keep flying. We waited for the wind to drop in the evening, and I made one more successful flight. I was feeling great and couldn't wait for more flying on the following day. 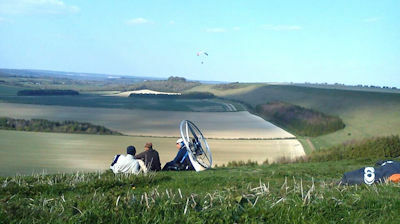 The following day I would be launching from the top of the hill on my own paramotor and wing. The launch went perfect but there was barely any wind to help create lift. I once again felt myself descending as I left the hill under full power. I eventually started to climb and Alex called through to tell me to get into the harness. I parked my brake, came off the power, and got into the seat. The engines idle was set very low and before I could power back up the engine cut out! Alex called "climb climb!" as he didn't realise the engine has stopped. I called back through, "The engine has stopped and I can't reach the pull starter!" Alex told me to find a safe landing spot and to watch out for power lines. I made a decision and landed in a small field about a mile from the hill. That was a pretty scary experience but it made good emergency landing practice. Alex flew over to me to help me back into the air, but there was no wind and he said I'd have to run like crazy. I set up for a forward launch, and ran like crazy! I left the ground but the under powered motor just wouldn't climb. I was heading straight for a hedge and Alex called through, "BRAKES". I pulled on both brakes and instantly gained about six feet which was just enough to clear the hedge. I let the brakes up and started to descend again.. And here comes another hedge... Alex called out again, "BRAKES!". I cleared the hedge again, but this time I kept the brakes pulled at about shoulder height. This gave the wing a little extra lift and allowed me to climb to a safe altitude where I could relax. Without Alex there to help out I definitely would have flown into both of those hedges. I was glad to have him there that day. Alex made his way back to the hill as there were two other pilots in the air that needed his instruction. I flew around happily for about 25 minutes and didn't expect any more problems. Suddenly I heard a bang and felt the paramotor wobble side to side. Alex called through and said that he heard it all the way from the hill about half a mile away. He instructed me to land immediately in the nearest field. I landed to find a bolt had fallen out of the clutch housing and demolished my propeller. That was the end of my fun for the day, and the following flights were taken on the Skyschool paramotors. The video below shows my final paramotor training flight with Zeb on the radio. The twelve days paramotor training with Skyschool UK taught me so much and it was worth every penny. I had flown four different wings and three different paramotors in various wind conditions. I'd launched in tight spaces, from hills, and flat fields, and even got to do two real emergency landings. The course also taught me lots of theory including some extra lectures on the intermediate course that I didn't mention. I also got to take an exam to become a qualified APPI PPG pilot. I was supplied with a training logbook to keep for proof of my qualifications and training. In all Skyschool was a great experience, the instructors were excellent and the APPI PPG training syllabus covered everything needed to become a competent pilot. Just in case anybody is wondering why Alex let me fly the under powered paramotor, I will explain. The motor was an HE R120 which should have had plenty of power for my weight. After an inspection it turned out that the person I bought the paramotor from had lied about the engine size. The carbon fibre engine cover was taken from an R120 engine, and it was stamped R120. But removing the cover revealed an R100 engine. 20cc doesn't sound like much, but it makes a big difference on a small two stroke engine. If Alex had known this he wouldn't have let me fly it. Find out exactly how to enter the wonderful world of paramotoring > HERE. Wondering whether you can afford paramotoring? Find out how much all of the equipment and training will cost; and take a look at my annual running costs >HERE. Find my list of everything you'll need to get before you can start flying > HERE. And don't buy a paramotor until you read this post on picking your first machine > HERE. Thank you much. Great help! Just checking your site, and I can’t stop reading. Great posts about training, equipment and your experience with Skyschool. I’m completely new to Paramotoring but already saving money for the training. Thanks for stopping by Thomas, I’m glad you’re enjoying the posts. I’ll never forget that feeling of discovering this awesome sport, good luck with your journey into paramotoring!